Finding the time for ourselves can really be a struggle, especially if we feel we are already busy with everything else in life. My life is full to the brim – I’ve got 3 kiddos at home ages 4, 2 and 6 weeks. My oldest goes to preschool 3 mornings a week, and I also blog/work around my kid’s schedules. I’ve also got a husband who I love spending time with, my family and in-laws that we try to see regularly, and all the fun parts of running life like groceries, housework, paperwork, etc. Life is busy. But I still make time every day to work on my art. It’s not easy, and there are days where I don’t touch my supplies, but over the last 1 1/2 years I’ve made making art a daily habit. I often get asked HOW I have time in my days for everything plus having time for my art. When people ask me this, the really short answer is this: I prioritize making art. Really, that’s the secret. I make making art a really high priority on my to-do list every day. It doesn’t mean that I abandon all my other responsibilities in favour of painting and drawing. It does mean finding a balance of letting some other things go, and finding creative ways to set aside time to create. Over the last few years I’ve come to learn that creating every day in one way or another is not an option for me – it is a necessity. I need it in order to feel balanced. This may not be true for everyone, but as I’ve come to know myself better I’ve learned that making art is crucial to feeling like the truest version of myself. So, how do I make art every day with three kids at home? 1. You have time – you just have to find it. One of the major game changers for my daily creative time was making the conscious effort to get up early every day. Having a new baby has changed that, but for the last 18 months before his arrival I was waking up at 5:30 every morning to get 1.5-2 hours of alone time before my kids woke up. Some people can’t imagine doing this, but for me it was a no-brainer. It also helps that my husband gets up at that time for work, but even on his days off I routinely wake early to go create. Evenings are your best friend. Instead of Netflix binging or mindlessly browsing Facebook, I choose to use that time to create instead. Sometimes this is working in my office, sometimes it’s bringing my artwork to the couch so I can draw while I catch up on shows. My husband will watch the baby so I can sneak off for an hour, or I will bring my work to them as I can. I really believe this is a time that is literally perfect to set aside for art or work that a ton of people don’t utilize. Your kids are asleep! I also really try to get all my tidying up for the evening done before my kids are in bed. So dishes cleaned up, toys put away, etc so when they are in bed, there is nothing I feel obligated to take care of. A third pocket of time I utilize is: NAP TIME. I am a firm believer of refusing to do ANYTHING during my kid’s nap time that is any form of housework. I won’t. Some might think this is selfish, but I absolutely don’t think mom’s should have to still be washing floors or doing dishes during their one mid-day break. Being at home with kids every day is HARD, and for me that pocket of time in the afternoons is sacred. My kids still nap thankfully, but there are days where we don’t have naps and I have to find another way to create while my kids are up. 2. Create alongside my children. Both of my girls love arts & crafts, and I try to capitalize on this to have some creative time for myself. They are 4 and just turned 3, so they need supervision for their art time still. I will set up our kitchen table with their activity and bring my art work to the table to create alongside them. I try to pick activities they don’t need me to do things for them, like colouring, painting, stickers, Play dough, etc. At the same time, I choose work for myself that isn’t too involved – so drawing, collaging, etc. This works great for us! My girls also get the benefit of free creative time and seeing me working on my art. I used to think that I could only work on art when my kids were all asleep and I was in my office. That’s a nice thought, and I still am able to do some of that, but the truth is that ability is starting to disappear as my 6 week old babe is starting to wake up more. I’ve started leaving myself “art stations” in easy to get to places around my house. I leave a sketchbook with a couple pencils & pens on my kitchen desk; I’ve got a sketchbook with collage papers and gluestick in my living room. I’ve set up all these mini “work stations” so if I have 10 minutes while my kids are playing, my materials are available and ready to go wherever I am. 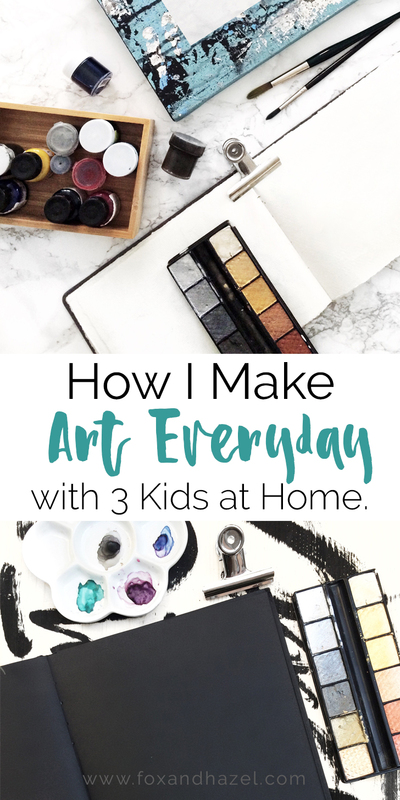 These are a few ways I’ve managed to make art a daily priority, even with young kids underfoot. It’s not easy nor perfect and there are days where making art just doesn’t happen. Not all these methods will work for you, but they are ideas in how to can find that time each day. 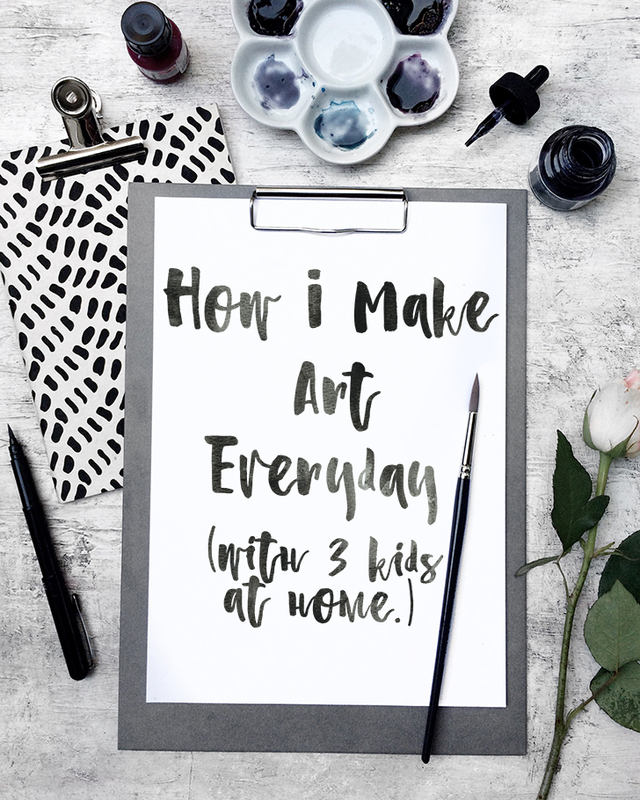 These methods have helped me make my art a daily habit, and has made it possible to make art almost every day with 3 kids at home. Do you have a method/strategy on how to make art every day? 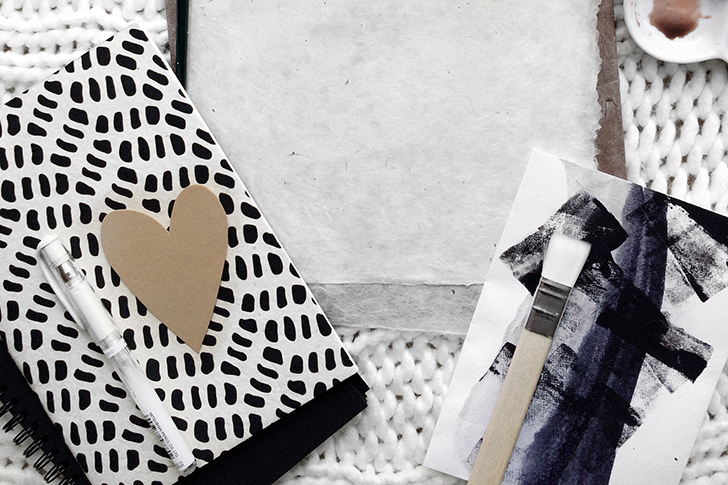 I’d love to hear how to prioritize creating in your day in the comments! I love your tip about nap time!! I'm going to start doing that too!! !